This recipe is low carb, gluten free, and a Trim Healthy Mama S Fuel. I have had this recipe ready for MONTHS! I keep using it in my own kitchen, but I have never posted it. I made them again this past week, along with sausage gravy, for breakfast, and I was blown away by how “normal” the biscuits and gravy tasted! These biscuits are not flavored in any way, so they are perfect for under your low carb sausage gravy (recipe here)! They are also an S fuel for Trim Healthy Mamas, so that means you can slather them with BUTTER! Yes! These will also make good breakfast sandwiches! Make up a batch at the beginning of the week and use them for an easy breakfast option! Fry an egg and a sausage patty, top with cheese, and you’re ready to go! 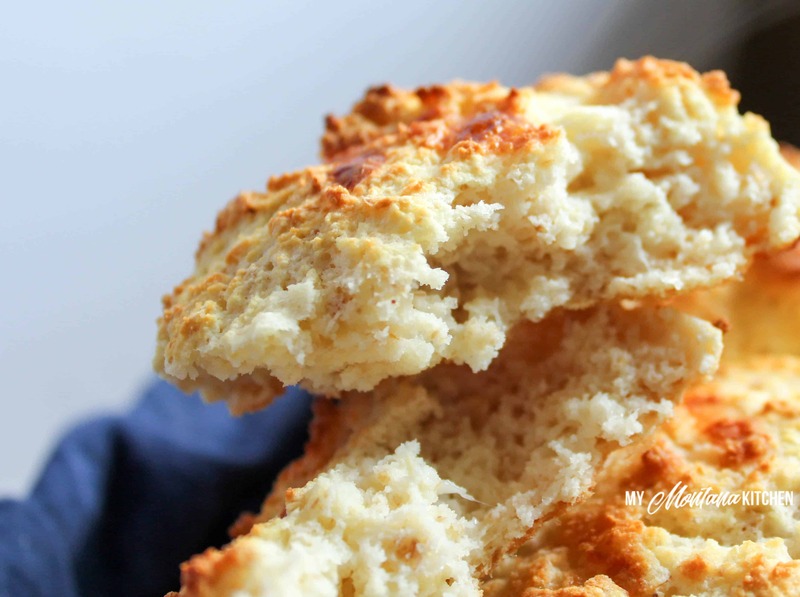 But let’s talk about texture – these biscuits are so soft and fluffy. They melt in your mouth! I love the texture! If you broil them for a moment or two at the end of baking, they get a nice brown crust on the outside, but remain soft and tender on the inside. Perfect! I chose to use the Trim Healthy Mama Baking Blend to lighten these up a bit. The Baking Blend lends to the light, fluffy, airy texture. 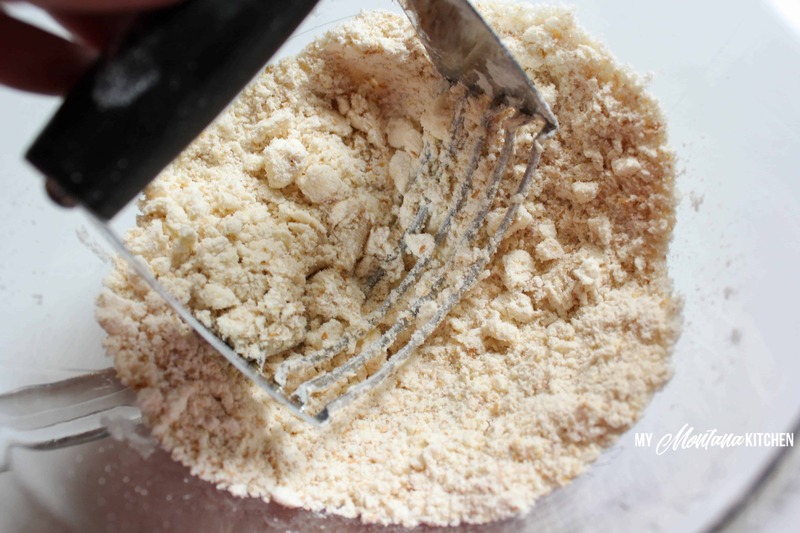 I believe you could also use an equal mix of almond flour, coconut flour, and flax meal, but I have not personally tried that mix for this recipe. I believe it would yield a heavier, more dense biscuit instead of the light, fluffy texture. These low carb biscuits even passed the taste test with my 8 year old daughter. (And that is saying something, because she is SUPER picky! And she loves bread.) Two of my dorm boys also ate them and declared them delicious! Score! I am so excited to hear what you guys think of this recipe! 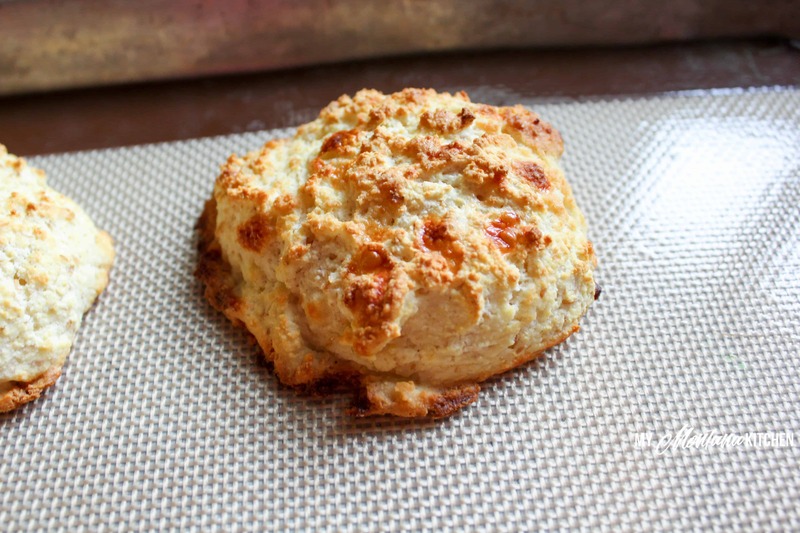 I love how easy they are – just between you and me, I much prefer drop biscuits because I’m too lazy to roll out the dough! So these are perfect for me! They only take about 5 minutes to mix up, then bake them for 12! Fresh, hot biscuits in less than 20 minutes? Yes, please! 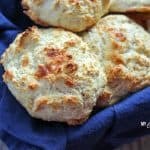 So what do you need for these Low Carb Biscuits? 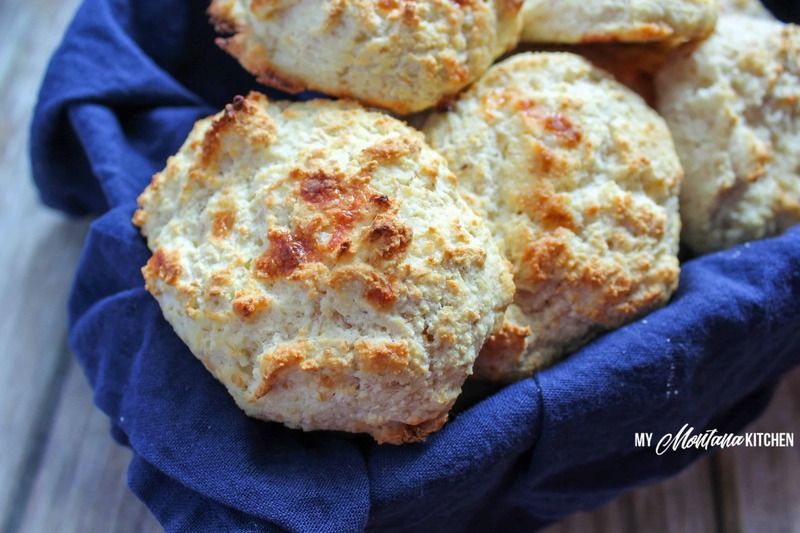 Easy to make, with only a handful of ingredients, these low carb biscuits are sure to become a favorite! They are easy to whip together as a side for supper or as a main part of your breakfast! In a large bowl, mix Baking Blend, baking powder, and salt. Using a pastry cutter, cut in butter until you have a crumb-like mixture, and the butter pieces are about the size of peas. Add remaining ingredients and stir just until incorporated. I’m a drive-through- Sue, and would like to flavor them up a bit. How much garlic and onion powder would you use? The picture looks so yummy! I would use 1 teaspoon of each! These sound delicious! Do the egg whites need to be whisked before adding to the dry ingredients? Not necessarily – I used carton egg whites. I made these the other night to go with our soup. I added a teaspoon of garlic and onion powder and they were delicious … even hubby approved and that’s saying something! These were so delicious!!! I made them with the sausage gravy recipe you gave and my son said that these biscuits were better than any he ever had! I made a double recipe and they’re all gone; I made 1/2 plain which were awesome , and 1/2 with the onion and garlic powder, which were really good too! My husband and other son loved them too. Thank you!!! I am allergic to dairy….would cold ghee work for these? I used butter flavored coconut oil and they turned out great. Would these freeze well after initial bake? Looking for items I can make ahead and freeze for the holidays! They freeze great. And I have microwaved them and I have put them in the oven to reheat. Both ways were fine. My family loves biscuits and gravy for dinner but I am always eating something else to stay on plan, until now!!! I halved the recipe because I am the only one in my family on THM and it was perfect. I did not feel like I was missing out at all. Your biscuit and gravy recipe is amazing. I made an extra batch of biscuits and froze them and now I can just pull out what I am going to eat with my meals. Thank you so much for all your wonderful recipes. Has anyone tried it with 2 eggs instead of 1 egg and the egg whites? I usually only buy whole eggs, and I hate dealing with leftover yolks. I am also interested in using whole eggs vs. egg whites since much of the nutritional value of an egg is in the yolk. Mine spread out – what did I do wrong? Mine spread out a little bit, they do not rise like a traditional biscuit. However, they should not spread pancake flat. 🙂 It is important to make sure you do not over-mix them, and make sure the butter is in very small pieces and spread throughout the batter. I found this recipe while trying to figure out what to do with this Trim Healthy Mama Baking Blend. (The THM website certainly wasn’t any help.) These biscuits are unbelievably good! This is the only low carb bread recipe I have ever found that comes remotely close to “real” food. Not only does it come close, it hits it out of the park. I might choose this recipe over regular Bisquick biscuits. I had read that THM Baking Blend can be used as a 1-to-1 substitute for white flour, but the substantial quantity of egg in this recipe is a reminder that the baking blend has a lot of coconut flour. Yeaaaaaaa!! Biscuits again. Just made these…so good and so easy. Thank You! These are so good!! Had them for biscuits and gravy. Mmm! These were delicious! I only had 1/2 and 1/2 and cheddar cheese and I added the garlic/onion powder. So glad you shared this with us!! What is the best way to store the leftover biscuits so they don’t mold and go to waste. Thank you very much for the recipe, it made wonderful biscuits and gravy-yummy! If you want to keep them more than a day or two, I would recommend storing them in an air-tight container in the refrigerator. I made these this morning. They held their shape perfectly, but under my gravy they had the texture of light fluffy dumplings. Still yummy. I think I added too much egg white– more like 1/3 of a cup. I would definitely make these again. I only have vanilla almond milk on hand. Could I use half and half? I just used sugar free vanilla almond cashew milk (25 cals./cup), and they turned out well! Yum! Just made these and used them for a bacon, egg and cheese sandwich. They were light and fluffy! I was really impressed that i could enjoy them warm. So many of the low carb items need to be refrigerated and eaten next day. Not so with these. I’ll make these again, thanks! !